“Doing it All” (or should I say #DoingItAll) was the theme of a week-long series by Maria Shriver on the “Today” show last week. I identified with many of the women depicted in the stories, as they tried to juggle careers, children, marriages, family, financial concerns, special needs children, and free (me) time. While all of our circumstances are slightly different, the underlying theme is the same for nearly all women… Why do we feel the need to do it all, and do it all well? Do we feel pressured to do it all? Does society expect us to do it all? 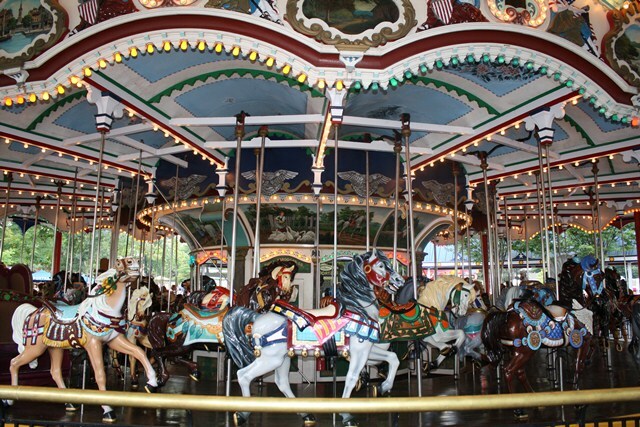 By the way, The Merry-Go-Round = DoingItAll. Along those same lines, The Atlantic recently ran a story titled “Moms who cut back at work are happier.” It’s based upon new statistics from the Pew Research Center, finding that growing numbers of women are making career sacrifices in order to spend more time with their families. Hello?! This is exactly what Off the Merry-Go-Round is about! How wonderful to know we are not alone. The article goes on to contrast these findings with the scads of recent news stories about women “leaning in” and making great career strides. I want to say, that I am all for equality in the workplace, and I applaud strong women accomplishing great things and breaking down stereotypes. However as someone who once leaned in, I am happy to now lean back a bit and focus on my family. It was a conscious decision on my part. I love working part time, setting my own hours, selecting projects and clients—the ball is in my court—and it all revolves around my family. So for me, personally, the stereotype I run into is this: People expect that once you have “done it all” that you should continue DoingItAll. So to hear that 65% of mothers say they too have made sacrifices in their career lives… that is extremely gratifying. Maybe the tide is turning and society will start seeing beyond women’s careers in judging their status in life. Raising wonderful children into productive, kind adults should count among the world’s toughest—and most rewarding—assignments. Last week, the magazine Working Mother retweeted the following: “I don’t see a problem with women leaving the workforce for family. I see a problem with them being unable to get back in.” (Lauren R. Parker) That may be the next chapter down the road for some of us, as our children grow, leave the nest, and we attempt to re-enter the full-time job market. This data suggests that one reason married mothers who make work sacrifices are happier is that they would prefer to scale back at work—at least for some portion of their lives as mothers—and are happier when they can do so. This reality is often glossed over in the public conversation about work, women, and family, but as Catherine Rampell at The New York Times observed: “Not everyone aspires to be an executive at Facebook, like [Sheryl] Sandberg, or to set foreign policy, like Anne-Marie Slaughter” (author of “Why Women Can’t Have It All”).” Instead, as K.J. Dell’Antonia put it, most women are “striving for flexibility and balance” when it comes to juggling their aspirations for success at home and work. Again, in the public conversation and the formulation of public policies regarding work and family, let us not forget that the happiest married mothers are those who are able to lean homeward, at least for a season in their lives. I have jumped off the full-time Merry-Go-Round of DoingItAll. Now, having one foot on the merry-go-round, working part-time, still involves a good amount of juggling but it’s manageable and fulfilling. I have no regrets about putting my family first. Good friends truly understand this and are supportive. And if people aren’t supportive then they are missing the point, missing the importance of family, and I truly feel sad for them. DoingItAll is indeed possible, for periods of time—however, some area(s) of your life will suffer. I think the real secret to DoingItAll is to give yourself the gift of grace… because there are times in your life when you simply can’t do it all. And that’s ok. Excellent! I agree with you completely. It’s about balance and sometimes it’s about timing. I was fortunate in being able to focus only on my boys when they were younger. As they started school, I had time to re-enter the workforce. Women have to decide what’s best for themselves and their families, and stop giving the media or other people the power to determine what should be. Thanks Jen & kudos to you for being such a strong and caring mom!